Integrate Piwik PRO with Looker to visualize your data in new ways, create and share Piwik PRO custom reports, and get quickly to more data-driven decisions. What can you achieve with Custom Reporting with Looker? Looker’s flexible algorithms will automatically transform your Piwik PRO data for use on the platform. You’ll quickly benefit from Looker visualizations and analysis tools. Create data-rich dashboards and custom Piwik PRO reports without the hassle of detailed database queries. Share reports by simply sending a URL. Integrate with any kind of Piwik PRO installation: Looker is available in both cloud and on-premises versions. Looker can help you generate more actionable insights from your Piwik PRO data. Create and easily share data-rich dashboards with your team. Looker will adapt to your particular data set and will automatically present the latest in real time. Since Looker also has cloud and on-premises versions, it can adapt to your compliance needs. Data-sensitive industries can benefit from the added features Piwik PRO with Custom Looker Reporting can provide. With Looker integration you’ll get web-native, interactive visualizations across your entire data ecosystem. Let all users of your Piwik PRO data create and share visualizations so the whole team better understands your data. Custom Reporting with Looker doesn’t require extensive technical knowledge. Anyone can create new visualizations and explore your Piwik PRO data. However, analysts with more experience can go deeper and create more complex reports to share with the whole team. Responsibly collect all the data you need with Piwik PRO. Use Looker’s powerful data processing and visualization tools to get even more value from your data. With this combo, you don’t need to sacrifice powerful data-based insights to protect user privacy and stay compliant. Stay on top of your data. Use Piwik PRO Custom Reporting with Looker to create data dashboards that will quickly expose any problems or shed light on opportunities. 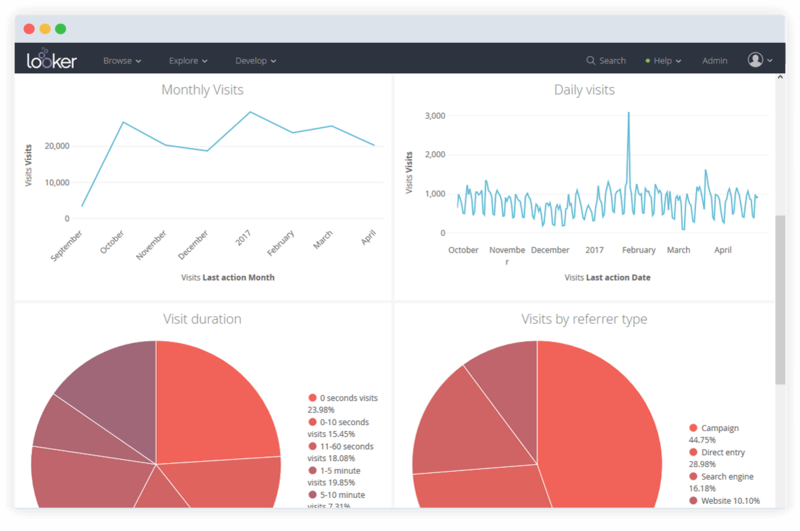 Easily customize your dashboard and reports to see just the data you need for your business, in the way it makes sense for your team. Quickly share custom Looker reports through Slack, email, or create reports that will be automatically emailed to you and your colleagues. Make data-driven decisions part of your team culture.